They allow you to cut down on the amount of material you cover in your presentation and so not commit information overload. They allow you to stop worrying about forgetting what you want to say. Audience members will have a concrete reminder making your presentation more memorable. Audience members can easily contact you later. They allow audience members to relax about having to note down what you’re saying. If they like taking notes, they’ve got a place to do it. If they’re inspired by your topic, they’ve got more information on it. If they want to refresh themselves later on what you covered they’ve got a place to go. Don’t leave it till the last moment to create your handout. I’ve been guilty of this. We’re most concerned about the actual presentation and not making a fool of ourselves up on the stage so you work on what you’re going to say and the slides, and then 30 mins before your presentation you realise you should have a handout and hurriedly put something together. Handouts are much too important to be relegated to an afterthought. This is lazy and not effective. If your slides are bullet-point slides (not recommended) then they will often be cut-down sentences which will no longer make sense to the reader a week later. And if they are visual slides (recommended) then they’re also unlikely to make sense without additional text. If you’re presenting with visual PowerPoint slides, one of the easiest ways of creating a handout is to type the text of the handout in the “Notes” pane of the PowerPoint edit screen. Then print your slides as “Notes”. You’ll have an effective handout. An audience member should be able to relate the handout to the presentation they’ve just attended. If you use the Notes pane of PowerPoint as I’ve suggested above this will happen naturally as you’ll be guided by the visuals you’re using in the presentation. You handout should have the same title as your presentation and should follow the same structure so that audience members can easily find the information they want. Presentations are not a good format for transferring a lot of information. However, they are good for inspiring people to find out more about a topic. That extra information can be in the handout. And if you’re the sort of person who wants to tell the audience everything you know about the topic… you can put it in the handout. If you’re citing research do include the references in the handout. For most presentations (scientific presentations to a scientific audience would be an exception), don’t clutter up your presentation or your slides with references. But do be able to say: “The reference for this research is in your handout.” Let your audience know where they can find out more: books, websites, blogs etc. Handouts are a great place to help people put ideas from your presentation into action. You could either list a series of actions that people can take, or provide a worksheet that people fill in on what actions they will take as a result of your presentation. Have people fill in the action sheet near the end of your presentation. The handout may be passed onto people who were not at your presentation. Or an audience member may look at it a year from now when they’ve forgotten most of your presentation. Make sure that it will make sense to them. For people who weren’t present include brief credibility-establishing information about you. Some people like to take notes during a presentation. Provide plenty of white space (or even some blank pages at the back) so that they can take notes on the handout and so keep all the information related to your presentation in one place. You’re not limited to paper. My bioethics teacher friend who presents at bioethics and education conferences across the globe provides each of her attendees with a DVD with lesson plans and resources. Cliff Atkinson suggests creating a “home page” for your presentation in his book The Backchannel. If you don’t have a website, you could create a squidoo lens or a Facebook Fan page. Or if you’d like to do more than that, create a wiki website (try pbworks or wikispaces) or use blog software. Both of these can be done for free and just a little technical courage (techphobics shouldn’t try this). All of these options allow readers to comment on what you’ve written, so it’s a great way of continuing the conversation with audience members. For instance, audience members can ask you questions they weren’t able to ask at the time. If you decide to go the web way, you can cut down the hard copy handout to one page with the most important points from your presentation, your contact details and the web address. This is a perennial topic of debate amongst presenters. Some people are concerned that if they distribute the handout first, people will stop listening and start leafing through it. The problem here is not the handout, it’s that your presentation is not engaging enough. Not distributing it till after the presentation suggests that you think you know best how people should pay attention to your information. Let your audience decide for themselves. Recent research suggests that providing handouts to university students before the lecture does not harm their learning. Update: In the comments to this post, Cathy Moore, Mike Slater and Adam Lawrence have identified three good reasons for distributing your handout after your presentation. I’ve highlighted these reasons in a new post: Three good reasons to distribute your handout after your presentation. Finally, if you go off on a tangent in reply to a question, do let them know that the answer is not in the handout. I’m going to jump right in and disagree with you on point 12 – I’m one of those who believes that handouts should be distributed after a presentation. If audience members have the knowledge of what is to come in a presentation in their hands, they can feel less inclined to listen. Even worse is the fact that if speaker notes are used to make the handout (a practice I agree with), the audience can more or less read along with the presenter – even if he or she paraphrases. I also have to agree with Simon – most university lectures are Death by PowerPoint personified, and professors are lucky if their students stay awake enough to look at the slides – reading ahead in a handout is unlikely to be an issue! However, I do think that distributing worksheets is a good idea – audience members can take notes, and annotate printed diagrams. This will help keep them engaged with the content, and actively absorbing the information. The full handout can then be given out later! I attended lectures at university long before Power Point was invented. They were Death by Windbag-Lecturer-Droning – with one or two notable exceptions. The problem is not Power Point but the presentation of material … trust me students have been sleeping through lectures since the beginning of higher learning. On my own side, one thing I would change if I could go back is to get to bed earlier then night before. …and continues to be a topic of heated debate amongst presenters! First of all I agree that the research is not the last word on this issue. As you point out it’s in the context of university lectures, and also the researchers themselves point out that’s it’s preliminary research and more investigation is needed. 1. Audience members prefer it (in the research cited above 74% of students preferred to be given handouts at the beginning). If they want to, they can quickly flick through the handout to check how comprehensive it is – and so be reassured that they don’t need to take copious notes. 2. It reduces the amount of notes they have to take. That means they can be more engaged in the presentation and not miss something because they were taking a note of what I had said a moment before. 3. It puts decision-making in the hands of the audience member. To not give them the handout before the presentation smacks of “I know better than you, what suits you”. 1. Being engaging as a speaker so that listening to me is much more interesting than reading the handout. I’ll then wait till people have finished their quick flick through before starting. This sets up a clear expectation that they won’t spend the presentation reading through the handout – but without taking the decision out of their hands. But (you knew it was coming, didn’t you! 🙂 ) what’s point one got to do with anything? Just because the audience prefers it doesn’t make it right from the point of view of their learning experience! Most people want to bring back capital punishment but that doesn’t make them right – because they don’t know the facts, they just know their opinion! Surely the job of the presenter is to do the best for his/her audience, not pander to what they (think they) want? For example, I deliver a five hour (God help me) course on statistics for research to PhD students at one of the UK’s top universities. The students who attend tell me that they want a more technical course, full of formula and so on. Now, with 25 years experience as a full time, professional researcher, I KNOW that the course they need is about the philosophy of statistics and the pitfalls of using them badly, etc, which is a different course altogether. That’s a great distinction to draw. And I agree that what people want and what they need is not always the same. But I don’t think that that means that we should disregard what they want. It’s a factor to consider. And when dealing with mature adults it’s an important factor – I tend towards letting them make their own decisions. I will suggest that they will learn better if they don’t try and read the handout at the same time as I’m talking. But the decision rests with them. I too have to teach measurement related subjects so I sympathise with your plight. My suggestion, for what it’s worth, is to dig a little deeper into why your delegates want lots of detailed formulae. My experience, admittedly of a more general analytical topic area, is that people have a problem but they don’t tell you that. Instead they tell you what they think they need to help them solve their problem and this is gathered from all sorts of sources and is often wrong! In your case, they have possibly previously been bamboozled by know it alls chucking statistical jargon at them – F test, t-test, CHi square, confidence intervals – and they felt inadequate. Once you have unearthed their real problem, you may have better luck in getting them to listen. Keep at it because you’re right. I think this is a case of “horses for courses”. Personally I don’t like giving out handouts in presentations as there is usually some element of “surprise”. I “reveal” points during the presentation and if the audience had copies of the slides (or even a more detailed handout) in advance the effect is ruined. Also, my own experience is that if I’m listening to a presentation where I’ve been given the handout in advance I can’t help but flick ahead of the speaker – I think that would be the case with many other people too. A lot has been said about how people can only focus on one thing at a time (hence the trend for simple, visual, slides that don’t distract from what the speaker is saying. Surely handing out the handouts goes against this. I agree that if there’s an element of surprise in your presentation, then it makes sense not to distribute the handout beforehand. I also agree that we’re a curious lot and if you’ve been given a handout many of us tend to flick through it to see what’s coming. My suggestion to handle this (where there’s no other good reason to withhold the handout) is to explicitly allow a few moments for people to flick through the handout to satisfy their curiosity. Wait for people to return their attention to you. You’ll have then set up the expectation that people will put their handouts down and pay attention to you during the presentation. What about the attention span issue? By the time you get to unveiling your surprise the audience may be so lost in other thought they miss it altogether. Writing helps people keep their minds from wandering. Writing everything makes them fall behind. Writing the occasional note on a handout is a nice fit. In the work world handouts are requested. If I cannot hold people’s attention, my presentation is either too long or it does not fit the audience. Or I am the wrong person to deliver it. Honestly – if people’s mind’s are wandering, I am not doing my job as a presenter. The debate about handouts seems to assume that the presentation is mostly lecture and not, say, more of a workshop that poses questions for discussion and then reveals answers or suggested solutions on subsequent slides. I use visual slides to set up a dilemma and then have participants brainstorm how to solve the dilemma. Then I reveal slides that show some solutions, and we discuss how those fit in with the solutions we brainstormed. If participants had the handout at the beginning, the brainstorming about dilemmas would be empty, because all the participants would have to do is look at the next few slides and see the suggested answers. When I go to conferences, I’m actually a little disappointed when a speaker distributes their handout beforehand, because it suggests that the session will be a lecture and my presence doesn’t matter. I suspect that participants won’t be asked for their ideas, there will be little discussion among us, and there won’t be any surprises. If I skim the handout and see that nothing there is confusing or challenging, I’ve been known to take the handout and go find a different presentation. If you’re in a situation where everyone expects you to distribute a handout at the beginning, you could distribute a list of questions that you and the audience are going to discuss, along with the promise of a complete handout at the end. This both primes the audience for discussion and reassures tire-kickers that your talk could be worth staying for. As in my reply to Mike, I agree that there are situations where you don’t want to distribute a handout beforehand, and the workshop/discussion situation that you describe would be one of those. Your reaction when you go to a conference presentation is interesting. You could think of this way – being able to see the handout ahead of time has saved you from sitting through a boring presentation! And I love your suggestion for workshop sessions to distribute a list of questions with the promise of the complete handout at the end. Great points for effective handouts. I like to make my handouts interactive. I intentionally omit specific words or phrases so that the participants have to fill in the blanks. I also will include some pictures from my slides, especially if those slides provide a good hook for a story or allegory so that the participants can write notes beside the picture. Instead of just providing handouts full of text, the more interactive we can make them, the more learners will be involved with the content and concepts presented. And, leaving spaces for them to write down how they will apply what they are learning like your action plan is a great way to try to move the content from awareness to action. I like your point about including the visuals from your presentation – I think this is really important (and can’t believe I didn’t highlight it in my post!) so thank you for drawing attention to it. Regarding “fill in the blanks” handouts I’ve been on the receiving end of handouts like this where it’s felt like I was back in school. How do you manage it so that it doesn’t feel like that? Interesting idea to keep the audience present and on point. I wonder how that would be received in a business context. I have used games, songs, dances, karaoke, and even flying sharks in business contexts. The response is invariably relieved and joyful: “Great! No bullet points.” And they remember my message, if the method fits. Regarding point 12 – distributing handouts at the beginning – I read the research that was referenced, and unfortunately one key element that was missing was what kind of slides were used, and what kind of handouts. I would be willing to bet that like almost all university presentations, the handouts WERE the slides, and the slides were bullet-ridden slideuments which are no use as a visual aid and no more use as a handout. In that situation, I would certainly recommend to the lecturer to distribute the handouts at the beginning, because participants WILL need to take notes in order to make the handouts any use at all (plus with that kind of lecture, you run the risk that many students may leave before the end). As a presentation coach, I would not recommend that kind of slide, nor that kind of handout, and therefore my default position for a good talk would be to give handouts at the end, containing all the useful and necessary notes, but to ensure each participant has blank sheets of paper available should they want to take notes. I tell them at the start that they will get detailed notes later so they can sit back and listen – and enjoy. Unless by some miracle the researchers studied the classes of the very few lecturers who use proper visual communication, this research is of no use to anyone who does. Sorry to focus on that one issue which should not overshadow some excellent points about how to prepare great handouts! You’re quite right to question the applicability of the research. I agree that the type of slides used could influence the results. Great post, but “before” doesn’t often work for us either. One main reason is this – we use surprise as one of our main tools in presentations. With a handout – goodbye surprise and the attention boost it guarantees. Put it like this – would you want the full plot and punchline written on the back of your DVD cover? And a more prosaic reason – we try to keep our presentations highly flexible, and to follow up on ideas that come from the dialogue with the audience. Any preprepared handout is dated the moment we start. 3) as said, it reflects the true content, not the planned content. If I do produce a summary in advance, then I show and describe it beforehand but distribute it at the end. This reassures the audience, without promoting read-ahead, and keeps their eyes on the action. We post a live list of points/web links and allow the audience to collaborate as we speak. Since it is a web-based document, everyone only needs the URL to review the discussion and to pick up the links that hte participants have added. It works for us! That sounds like a great idea. Thanks for sharing. Distributing hand out is a good idea, but it should be after you finish your topic. Earlier distribution cause inattentiveness and distractions from the speaker. Oh! why to listen to him/her it is already here in the hand outs?. Oh!. its common speech , i have already read this. I shall go home and read it peacefully , but it never happens, you will never find where the hand outs are kept. The presentations is not been since it is already there to read before you deliver. The interest in the listening goes off if the hand outs are given before hand. Most of them just ignore the hand outs. May use it for jotting some thing which is irrelevant. Like phone numbers/credit card nos./may be for drawing and sketching.And many more i can add. It is good to give hand out after you finish cause the written documents and always handy and useful for the references. You make the point that an audience member won’t listen to your presentation if they already have the handout. In my experience this is only the case if the presentation is little more than a lecture. If the presentation is a rich, interactive experience they will soon put the handout down and pay attention to the live event. People might doodle (draw and sketch) on the handout. That’s OK. It doesn’t necessarily mean that they’re not listening. I’ll tell you why. Handouts don’t need to mimic the presentation and there’s lots you fill in as a lecturer. Before the days of handouts, the “interest in listening” was directly proportional to the quality and content of the presentation. Not a single professor was able to force listening for the length of an entire lecture unless he could engage the students in the content. If the audience is thinking why listen to him … then take ownership of your content. It’s not a question of handouts. Wow this subject has certainly caused quite a debate. My comment was aimed at the earlier responses which were of the ‘save it till the end’ variety. There’s possibly a half way house here (or is this merely a classic British compromise?). You might be able to give some material as a handout without spoiling the plot for example. :-). Yup – that’s very honest! And I’m sure that it applies to more people that just you. And I think your suggestion of handing out something beforehand and something afterwards is a good one. For instance, you could hand out a worksheet or action sheet for writing on during the presentation – this is similar to what Cathy Moore suggested in a comment above. I’m going to take the handout issue from a different angle. Rather than weigh in on the distribute them before or after (because that has been covered beautifully by others and I could argue both sides depending on the type of presentation), I had some thoughts about when they are created. Not only would I agree that you shouldn’t wait until the last minute and definitely not just hand out your slide deck, I would suggest that often you may want to start at the end. Create the handout, or at least a really good draft first. This can help you determine the key points you will present. 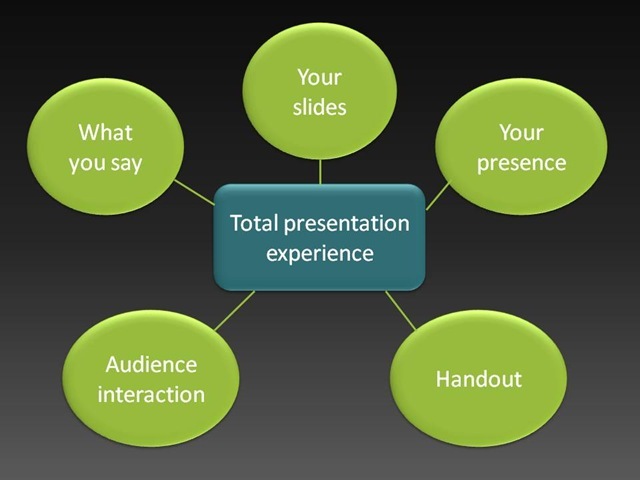 You’ll be less likely to throw everything into the presentation, knowing that you will be giving them the information. That way you can use the presentation to spark interest, energize them and lay the groundwork for the bigger picture. It was a great reminder that you provided about remembering what happens after. The presentation is just a launch point. This is an excellent idea. The problem of presenters trying to cover too much in their presentation is so pervasive! Knowing that you’ve created a comprehensive handout and seeing the presentation as a vehicle for highlighting and emphasizing the main points is an effective antidote to that. Thank you for your contribution – and adding another angle. I ganna definitely apply some of these for my next presentation! All these great points and comments refer to face to face presentations. An increasing amount of customer interactions, especially in sales, is performed virtually over the web – i.e a webcast. In these situations I recommend providing the audience with a 4-6 page/slide summary of your presentation – especially if there is some point or diagram which is central to the presentation. By giving this summary to the audience beforehand it actually helps keep their attention and stops them zoning-out and doing their email instead! Thanks John, I’m not experienced with webinars and webcasts so thank you for that perspective. I appreciate the Post, Olivia, but I’m in the camp that says don’t hand them out until after the presentation. Better yet, be green and direct them to your site. There are opportunities there to capture emails, survey and sell. The less distractions the better when you’re giving a presentation. Hi Fred, I agree that directing people to your website is an excellent strategy. And I can also see that there can be good reasons to distribute handouts after the presentation – as many people have argued in these comments. But I’m still not convinced that avoiding distraction is a good reason to leave handouts till after. The reason for this is that this is a presenter-centred reason, rather than an audience-centred reason. I have differing points of view on this, completely depending on what you’re teaching and I’m in a canundrum of my own at the moment. As a teacher in K-12 system worksheets are given immediately and typically notes are given later because they distract the students. I have 2 concerns with giving a complete “how-to guide” to students at the beginning of the workshop. 1. Will they just sit and read and pay no attention to me? Sometimes it doesn’t really matter how engaging the presenter is. If they have a reason to tune you out they will. 2. What’s the point of coming to the presentation if the notes are freely available for download on my website and you get a printed copy immediately when you walk in the door? Who’s to say they don’t just take the handout and go home? 1. They write like mad the entire presentation and get no practice on the computer, which defeats the purpose. 2. Even if I only give partial notes they still write like mad and it’s still pointless. So I’m not sure what do with it. Thanks Olivia – that’s a great list. And the comments have added a lot of value too! That is a great list. You provided such nice information. I’m starting a blog soon but have no coding knowledge so I wanted to get guidance from someone with experience. Any help would be enormously appreciated! Wonderful decision and advice, truth is that i don’t do much presentation, but your methods here are really awesome, thanks Sire. hi, i want to ask. do you have tips and tricks to have a high confidence when doing public speaking? although I practice a lot, still I lack confidence every time doing public speaking. Need to be more relaxed when you deliver your next presentation? Learn a system that will allow you to focus on engaging with your audience - not worrying about what you're saying.